It’s getting to that time of year (again) when the blog slows down? Why? Because I’m not gunna be away from the computer. I’ve been catching up a bunch of keywording and editing, and so forth, from the winter, which is a poor way to spend the spring. Here’s a photo from a month or so ago, when the northern lights were rockin’. They came on just as sunset faded – kinda of like a double-header at the movie cinema, although I can’t think of a movie that is a awesome to watch – maybe “Crash”. The lights dimmed not too long after this, before it got really dark, and I thought the show was over. They came back out again around 2am, and I was fortunate to get up and get some more images, one of which I posted here a month ago. I’ll be slowing down a lot with posts over the summer, as I’ve got a full schedule booked, which I’m super excited about. I’ll try to get a trip report done for each trip between trips, but don’t want to make any promises. In the meantime, take care of yourselves, and drop in from time to time and see what’s new here. 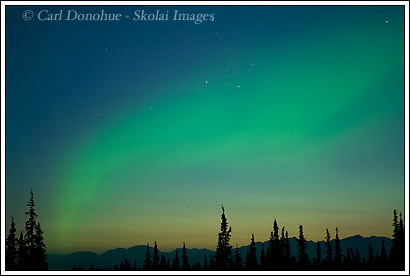 This entry was posted in Alaska, Northern Lights, Wrangell - St. Elias National Park on May 28, 2008 by Carl D.
We’re all excited about your summer trips! You KNOW we are all going to drop in to see what’s happening on your blog. There are no words to describe that photo except off the chain!!! It is exquisite. Ron’s got a really cool photo of his tripods on a rocky outcropping on a gorgeous day, with an exquisite background. He was telling about things in photography, which is very interesting. I am so glad I found both of your blogs. I love how you both tell different stories, rants, & how you photograph your pictures. Maybe one day I can throw my Walmart diposable camera away!! You take care & stay safe. I know I will be checking both of your blogs frequently! Grab your disposable camera and come visit Alaska! I’m bummed not to be joining you in Icy Bay. Have a great summer and be safe! This is an amazing shot … love it! Our summer is kicking into gear also. We had a great three day trip into our favourite early spring haunt in Jasper last weekend … even saw our first griz of the year on our second day in. We first noticed a black bear feeding in a higher meadow, and then saw the griz feeding just 100 to 130 metres away – pretty wild. Not much green grass around, so I guess they both take what they can get and forget the usual pleasantaries. Some year, if you ever come through in early May, we’ve got to take you in there. Pretty cool area of Jasper for a lower elevation zone. Anyway, it’s fun keeping up with your site! Thanks all for the posts. I’ll put up a new post now, and schedule some others for posting over the next few days, so you all don’t get bored. Ron,how did you know I am heading to Icy Bay? How did you know my name was Ron! I had no idea your name is Ron.